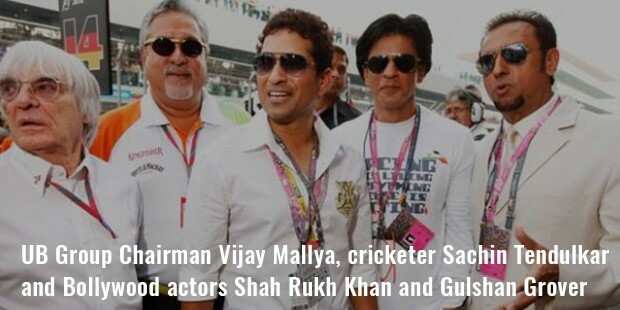 UB Group Chairman Vijay Mallya, cricketer Sachin Tendulkar and Bollywood actors Shah Rukh Khan and Gulshan Grover are seen on the grid before the Indian Formula One Grand Prix. United Breweries Group is an Indian Conglomerate Company that operates in beverages, aviation, electricals and chemicals. The Company Head Quarter is in Bengaluru. The largest producer of beer in India, United Breweries markets the beer under the Kingfisher brand. The Company has 79 distilleries and bottling units across the world, and a share of more than 40 percent of the Indian brewing market. The organization started with five breweries in South India in 1857. It was named as United Breweries in 1915. United Breweries initially supplied beer to British troops living in and around Chennai, Bengaluru and the Nilgiris. Vittal Mallya was the first Indian, to become the Director and subsequently the Chairman of UB Group (1947). The Company acquired McDowell in 1951, established Kalyani Breweries in 1960 and Kesarwal Beverage in Goa in 1965, respectively. 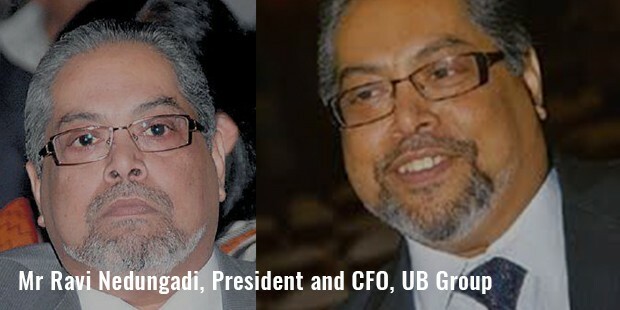 UB Group moved into agro-based industries and medicines by acquiring Kissan Products Limited, formed an alliance with Hoechst AG and started Aventis Pharma, an Indian Pharmaceutical Company. The Company took over Western India Erectors in 1988 and renamed it to UB Engineering Limited. The Bengaluru Government handed over the Mangalore Chemicals & Fertilizers to UG Group in 1990. The United Spirits Limited is also a flagship of United Breweries Group. USL exports the products to over 37 countries. Diageo holds 25.02 per cent of USL and it is the largest shareholder. UBICS Inc. is the global business software and IT Service Company under UB Group. It operates in North America, Europe, Middle-East and India. UB Group also owns the Formula 1 team; Force India, IPL cricket team; Royal Challengers Bengaluru and I-League teams - Mohun Bagan A.C. and Kingfisher East Bengal. 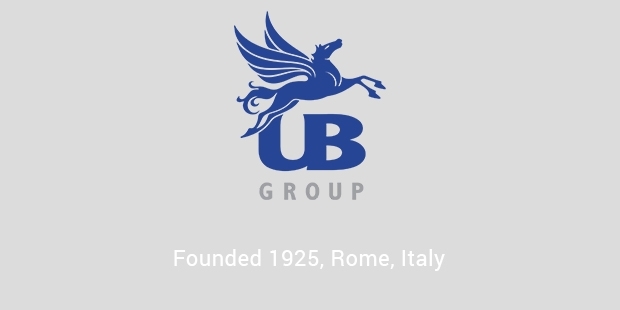 UB Group operates in beverages, aviation, electric and chemicals. The revenue of the company is US$ 5.4 billion (2013) and the operating income is US$ (290) Million (2013). United Spirits Limited has more than 140 Liquor brands. McDowell’s No.1, Black Dog, Dalmore, Jura and Whyte & Mackay won a Gold Quality Award from the International Quality Institute Monde Selection in 2006.